Hey there boys and girls! I just got back from Toys R Us, and much to my delight, they had some 2009 sets starting to show up on shelves. Along with the Power Miners and Pirates, there are now Clone Wars sets and such available at my local TRU. 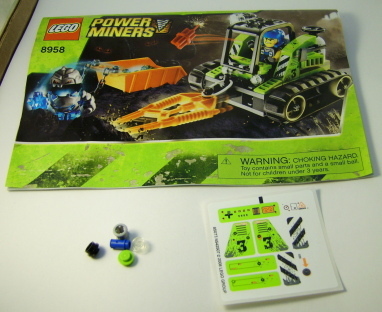 But enough of that, this is my review of 8959 Granite Grinder from the new Power Miners theme. Instructions, sticker sheet and leftover elements. 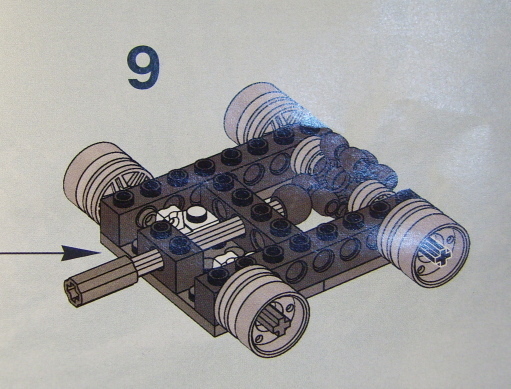 Instructions showing part of the drilling mechanism. This is a great set. Upon close inspection, this set is very well designed and fun to build despite its size. It's an excellent parts pack for $10. 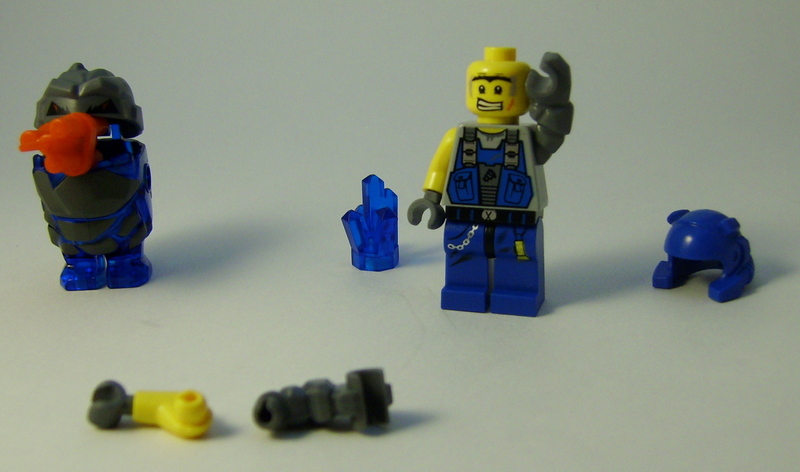 The miner minifig is all new, with a dual sided expression and torso with printing on front and back. His face is somewhat of a "rock on, dude" (no pun intended) look on one side and a terrified look on the other. He has a scar below his mouth and grime lining where the blue helmet sits on his head. I am very happy they brought back the Rock Raiders helmet in a new color. This feels like a fresh revival of the RR theme. The legs are even printed with a chain and flashlight design. The rock monster is hollow inside, allowing the included blue crystal (another revived RR piece in a new color) to fit inside his mouth. The top of the head is hinged like any of the Canadian characters from South Park, and it is a very comical looking creation. 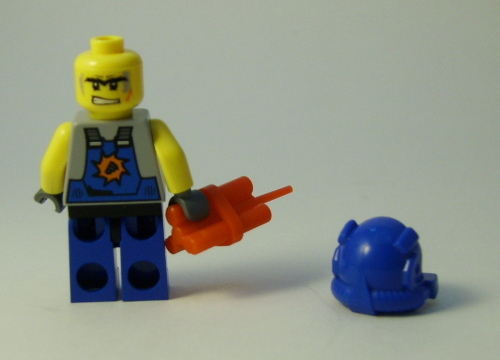 The best part is that his arms are minifig socket- compatible. as shown above. The actual vehicle packs a lot of cool design in a small package. There is a bit of technic, a bit of brick-built, and some SNOT on the sides. I love the little details like the flood light and white tanks in the back. The lime green and orange isn't that bad, but I think it could have been better color-schemed. 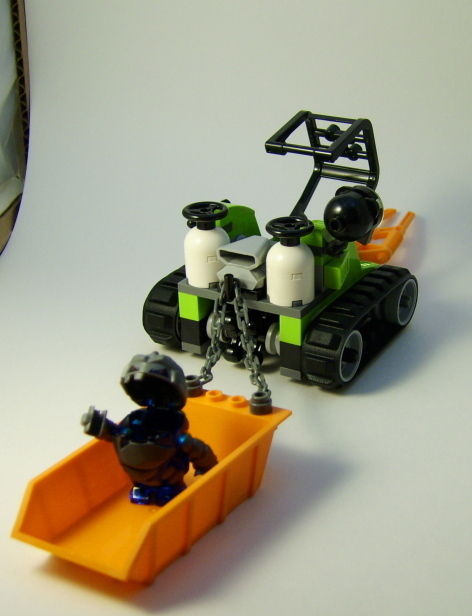 The dump truck bucket is attached by a chain to the back and is easily removed. The actual drilling mechanism is really neat. 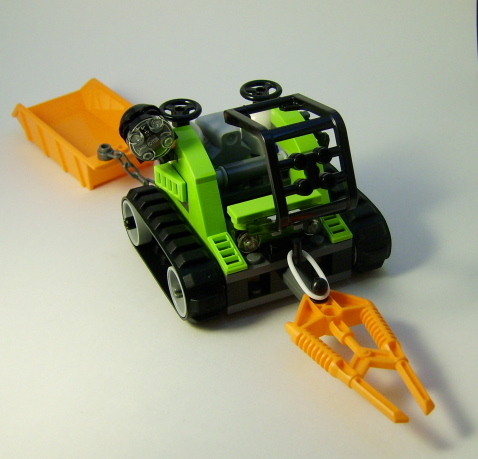 The rubber band snaps it back into place, while moving the treads bumps it forward, making a jackhammer-like sound and motion when it moves. The play function works very well. Parts: 9.5/10 - All new figures and parts, plus plenty of lime green. Would have been nice to have tread links instead of rubber tire treads. Minifigs: 10/10 - Includes two all new figures. Detail: 10/10 - very clever design and solid build. Playability: 8/10 - Cool mechanism but the wheels are a bit stiff and the bin that drags behind can be cumbersome. Price to parts: 9.5/10 - Under 100 elements for $9.99, though there are plenty of new and returning pieces here. Availability: 7/10 - Should be showing up everywhere soon if not already. OVERALL RATING: 10/10 - I'd definitely recommend picking this up as a test of the new theme. If you don't like it, you still get plenty of neat pieces. This on top of the Pirates theme is a very good outlook for 2009, since the Clone Wars sets pretty much stink. TLG is very creative with their unlicensed sets, and this set really shines. I picked it up to decide whether or not I liked the theme, and it really turned my opinion around. It's a great little set. Nice review! 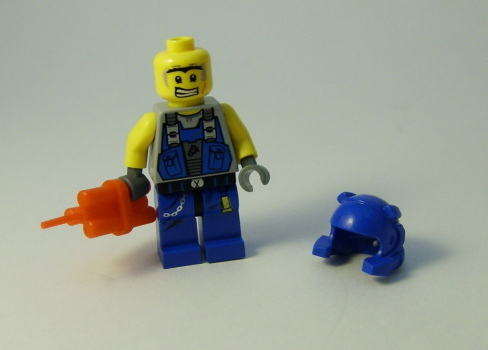 My only problem with the jack hammer on this set is that the hammer should be shooting forwards instead of backwards. But this would probably have meant too many extra parts for this technique to work. ... I picked it up to decide whether or not I liked the theme, and it really turned my opinion around. It's a great little set. Before I bought the Thunder Drill and the Mining Mech, I too was slightly apprehensive about this theme, but on building these sets I too was turned. Apart from the colors, which aren't too bad when seen in real life, but which might have been better matched, the design on these sets is excellent. SNOT techniques, interesting technic working parts, interesting and useful new parts and excellent minifigs.